3:30 Read a book (Phoebe); Kick a soccer ball against wall eight thousand times (Abby); do a little work (Andy); Look at clock and wonder “Is it dinnertime yet?” (Jenny). 6:15 Quick-pickle an onion, make rice, chop cabbage. Make two gin and tonics. 6:30 Sit on patio while Andy starts a fire. Experiment with mindfulness: This is dinner the way it’s supposed to be. Repeat to self. Wonder how daughter’s feet get so filthy. Say out loud without realizing. 7:00 Contemplate never getting up. 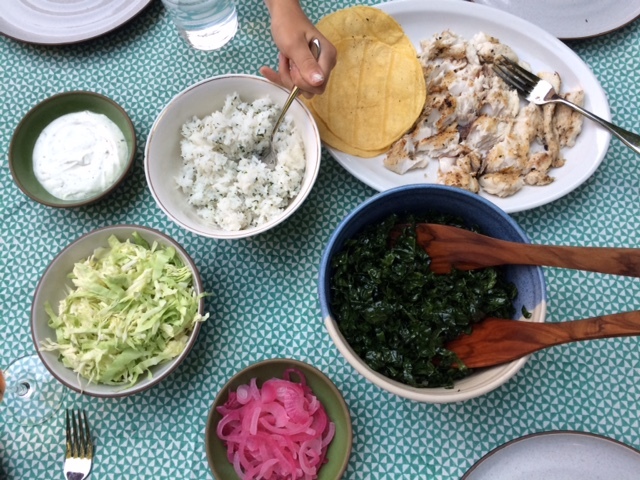 Andy heads inside; makes kale salad; returns with Mahi Mahi and tortillas. 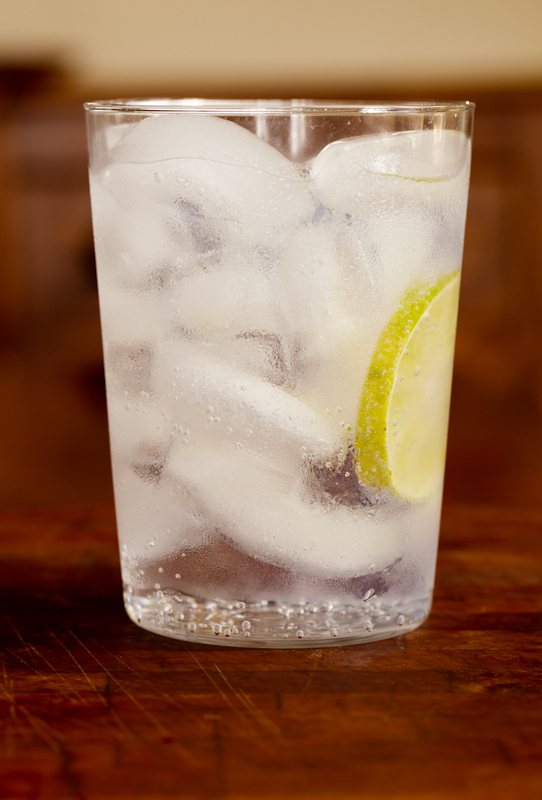 Fill two large glasses two-thirds with ice. Add 1 part gin to 2 parts fresh tonic. (Note: Nothing will ruin this drink faster than flat tonic.) Squeeze in the juice from a juice lime wedge and then toss the wedge into your drink. Stir. Bring red wine vinegar, sugar, salt, water to a boil, add onions and jalapeños and reduce to a simmer. Cook 3 minutes then drain, add to a bowl and set on table. Prepare white rice according to package directions — enough to yield 2 cups of cooked rice. When rice is finished, toss in a generous handful of chopped cilantro, the juice from 1/2 lime, and a generous sprinkling of kosher salt. Marinate a 1-pound piece of mahi mahi (or any firm white fish) in a little olive oil, salt, pepper, and a squeeze of lemon. (Add the lemon only about five minutes before you grill.) Once grill is hot, grill filet about 4-5 minutes a side depending on thickness. (Fish is done when it’s firm to the touch with out being rock hard.) Remove fish from grill to a serving patio and break into pieces with a fork or spatula. Add 6-8 corn tortillas to the grill and cook 20-30 seconds a side until you get a little char. Serve fish in tortillas with a few shreds of cabbage and the above toppings. This sounds so good (especially those quick-pickled onions)! Yum. I like to do my pickled onions in the microwave, in the same bowl I serve them from. Saves dishes, which seems to be my mission in life. Mmmm, very interesting – quick pickling, am definitely going to try it. Btw, I’m missing your kid book posts – have your daughters read True Grit? Its on my sons school book list and I had a look – its so fantastic. Jenny, thank you for your article. It is very useful. Fish tacos is one of my favorite meals. I think Tequila and Tonic would be good with this. My kids were practically lapping up cream sauce with a spoon! Best part of meal. Ahhhh yes! We did something similar last Friday but with steak, any vegetable that could be gathered from the garden, and steamed rice. Delicious!! That looks delicious! We usually have our Chipotle-style rice with shredded chicken and serve it in bowls instead of tortillas, but grilled fish tacos sound so good and much more appetizing in this weather (especially with a nice cold g&t). And I love pickled red onions – they go with practically everything and are such a simple trick to spicing up a dish!